Grâce à l'application Google Home sur iOS et Android, vous pouvez configurer et gérer votre Link 300 JBL en toute simplicité. Chromecast vous permet de diffuser directement depuis le Cloud, ce qui vous assure la meilleure qualité audio. Profitez d'un son cristallin, exactement tel que l’artiste l'a conçu. Configurez votre système en toute simplicité et contrôlez la diffusion dans plusieurs pièces avec l'application Google Home. Un guide détaillé vous aide à écouter rapidement votre musique. La connexion Wi-Fi 2,4 GHz et 5 GHz offre une connexion sans fil à la fois plus rapide, plus fiable et plus stable. Un design compact cache des haut-parleurs JBL haute performance pour offrir un son exceptionnellement puissant. 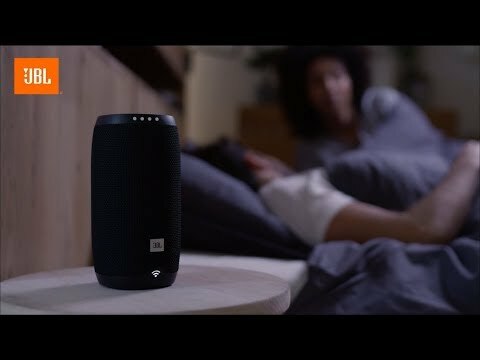 La Link 300 JBL est une enceinte intelligente à commande vocale équipée du Wi-Fi et du Bluetooth®, qui offre un son exceptionnellement puissant au regard de son design compact. Elle dispose de la fonctionnalité Google Assistant intégrée. Votre propre Google personnel. Toujours prêt à vous aider. Vous pouvez lui poser des questions. Et lui demander de réaliser des actions. Plus vous l'utilisez, et plus elle deviendra indispensable. Commencez simplement par dire « Ok Google ». 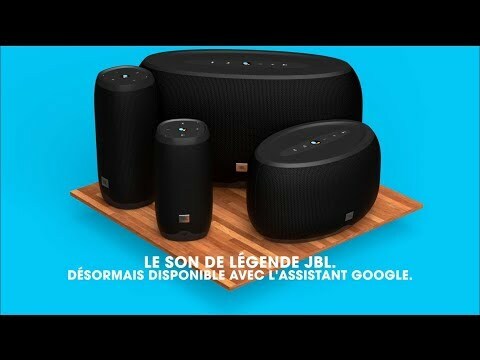 Cette commande vocale simple déclenche de la musique, des podcasts ou la radio sur votre JBL Link 300, à partir de services comme Google Play Music, Spotify, Pandora et bien plus encore. Et pour booster vos soirées, les enceintes avec Chromecast built-in peuvent être connectées afin de profiter de la même musique dans chaque pièce. JBL Link 300 est évalué 4.1 de 5 de 87. Rated 5 de 5 de Scerick par Great sound quality. Crystal clear with bass! I got this about a week or so ago to try it out vs. my Amazon Gen 2 and it blows the sound quality away. Super happy switching to this as I love to listen to music in the kitchen while I cook. Having the built in Google Assistant is also very handy. I haven't even turned this thing up as loud as it can go because it puts out a ton of sound in such a little package. Rated 5 de 5 de admtang par Fantastic Sound Quality and Features This is a great speaker for multiple reason. I outline my reasons below on two criteria - technical, functional, and price. My reasons are as follows: Technical: The speaker sound quality is phenomenal. You can hear a the bass very well and acoustics are great when the speaker is positioned correctly. Functional: Google assistant is amazing. I love being able to ask Google to play music from Spotify and having it fill the room. The overlap between amazing speaker quality and functional use is probably the best reason to buy this type of speaker. Price: While a bit pricier than other speakers, I compared it to a google home which is around $100. I already have a google home mini and the speaker quality is not great for music playback so I connect the mini to a soundbar for better quality, but with the JBL link it's essentially a two-in-one which is why I recommend this speaker over the google home. Additional Notes: There are some software things that need to be worked on from Google's side like broadcasting and calling features, but hopefully that will come with an update. Rated 5 de 5 de utown par Fantastic sound! I've used this for a few days now, and still can't get over how rich the sound quality is for a speaker this size. I checked the specs, and noticed that this unit puts out up to 50 watts (25 per channel). That explains a lot. It does a wonderful job of filling our rec-room with great sound. I was originally planning to just it as a bluetooth speaker for my phone (It paired easily enough), but now I'm playing around with the Google Assistant features. I may have been skeptical about talking to a speaker in the beginning, but last night, I found myself saying "Okay, Google: mute" when the phone rang.... and it did. Maybe I'm showing my age, but the only thing that would complete the package is an FM tuner. I realize that this device was designed to be a Google Assistant device that rocks-out (and does it ever! ), but it could also be a great upgrade to an existing table-top or under-counter radio while also providing modern features like bluetooth and Google Assistant. Rated 5 de 5 de Mikey Mike par Great sound, easy set up The Link 300 has enormous sound for such a small package. It has your traditional JBL sound with surprisingly good deep bass. The 300 will easily fill a large room with crystal clear music. The highs are a little bright at max volume, but this is the only negative I can give it. Google assistant was easy to set up (first voice activated speaker I have owned), and works wonderfully. I would highly recommend this for anyone looking for a voice activated speaker system for their home! Rated 5 de 5 de trfields76 par Great features and sound! I received this device about a week ago. My family and myself love the sound quality and how easy it is to use. I have it in my great room and it fills the entire house up with music. what is the service slot on the bottom of the unit? Hi, Can I connect the Link 300 to my JBL Control X wireless speakers and to my NAS ( Network Attached System) at home? Hi, Thank you for your question. It is not possible to connect the LINK 300 to your JBL Control X Wireless speakers, but the LINK 300 can play music from your NAS server, however, you need to find an app that supports Chromecast connection to play music. Is this able to be linked with a smart tv so that I can use it as an extra speaker for when I'm watching tv.? above answer is wrong. I know that my samsung smart tv will let you use a bluetooth speaker. Does the JBL Link 300 have an auxiliary input option? There is no Auxiliary option for the JBL Link 300. You can only connect with it via Wifi or Bluetooth. Can you pair these with the JBL Charge 3? Would the new Link 500 be overkill if used in a smaller room? The JBL Link 500 is preferable for large rooms such as a big apartment room or living room setup. The JBL Link 300 should more than suffice if to be used in a smaller room like a bedroom or a kitchen. The JBL Link 300 &amp; 500 requires to be plugged in all the time as it doesn't have batteries. If you wish to get portable Link speakers, the JBL Link 10 &amp; 20 is for you. how long does the charge last? Does it use batteries too? The JBL Link 300 does not have a battery and is designed to be used inside a home while plugged into a wall outlet.